Could it be that the very best high performance ecological heating system is also less expensive than a conventional system? Could it be so simple and quick to install that you could do it yourself? Yes absolutely, is the answer to both questions if you use a Specflue Xcel heat bank which, in my opinion, is still the best available. It is DIYable because all the pumps and wiring are already fitted to the tank so all the techie bits are done for you; one of my plumbers says he can fit one in a day. Because it is an open vent system it is absolutely safe and anyone is allowed to install it. Stainless steel tank will probably last a lifetime – I prefer the 500 litre one. Solar panels and woodburning stoves are properly integrated. Heat pump connections, if required, are sensible and prevent destratification. 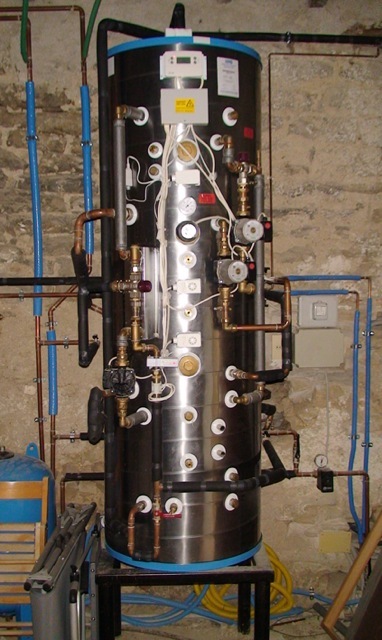 Condensing gas boilers run in condensing mode all the time and deliver their full power. Recovery times are almost instant due to stratification. Domestic hot water is pure, pressurised and plentiful enough to equal 4 combi boilers running at once. You don’t even have to install it all at once. Just keep adding the next bit when time and funds allow. I have installed many systems like this. In the days when solar PV gave good returns some of them were ZERO COST for all energy and my own house still makes a profit of about £1,000 a year. The system has been refined over the years and now there is even a special factory version of the tank incorporating a few of my favourite tweaks. I am also very particular about the way it is installed and the thermal characteristics of the house are modeled to make sure transmission matches power etc. I am also very picky about wood burning stoves; you’d be amazed how many people buy the wrong one. If you are interested in having a go then you can depend on me for lots of advice and supply of a matched set of the heat bank, stove and panels in the UK and across Europe. I try to round down on factory prices and, within reason, give free advice so there is no better way to do your project. Just use the contact form below to get going and I look forward to discussing your project with you. Chuck a car out of the back of a Hercules and gravity will accelerate it to 60mph in under 3 seconds. Back on the ground it is no coincidence that a few supercars also accelerate this fast. They have enough power to give a push on the ground equal to their own weight; a similar scenario to the car falling out of the sky. Friction limitations of normal road tyres level the playing field for all these powerful cars but in the next 5 years there will be cheaper sports cars and hatchbacks that can perform better, and they will be electric. The 2016 Pikes Peak race was won convincingly by an electric car powered by six Yasa electric motors. 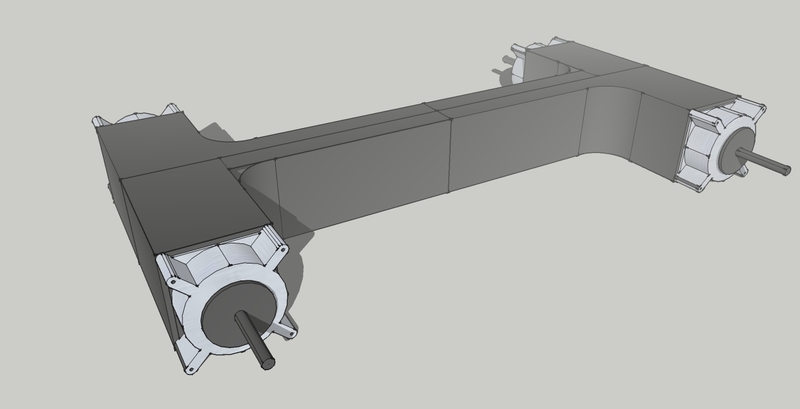 Four of the motors used in the racer will do fine for an example of how our future car should perform. Allocating one to each wheel of a 3,000lb car means that it has to transmit 750lbs of shove on the road to push 750lbs weight to match the supercars. With a reduction gear of 2.8 the Yasa 400 motor has enough torque to do this and yet still not run out of revs before 190mph. For brief periods the maximum combined power of the motors is 880bhp so that should be erm, adequate if twice the power of a Porsche Turbo can be called adequate. In practice the acceleration should be better than anything on the road today because with each wheel finely controlled to prevent wheelspin the grip will be as good as it gets. Individual wheel control will also transform road holding and handling. Imagine cornering with the outside wheels getting extra power and revs to augment the steering; worries about oversteer and understeer will be things of the past. In the same way that your satnav spookily shows the road ahead the on board computer can calculate the best power allocation to all the wheels to enable a safe trajectory through the bends and at speeds not really experienced in any car yet. Pretty exciting stuff, but there’s more to come. Of course if we could add enough downforce to effectively double the weight of the car (but not the mass) then it could go twice as well. 0-60 in 3 seconds becomes 0-120 in 3 seconds and back to a stop a neck wrenching 3 seconds after that. Cornering speed would depend more on courage and neck muscles than mechanical limitations. Sounds like fantasy land but actually it would be pretty easy to do this. Under the car a fan powered sucker pad, like an inside out hovercraft skirt, can easily develop sufficient downforce. The pad doesn’t actually touch the ground as small rubber wheels keep it a few thou clear. Obviously one wouldn’t drive around with the pad deployed all the time. It would be for track days or for seeing off the odd supercar at the lights. A 60″ diameter pad has 2,827 square inches. If the inside was a perfect vacuum the pad would hug the ground with over 18 tons (atmospheric pressure 14.7 psi). There would be heaps of torn up tarmac behind the car along with the odd flicked up manhole cover. Fortunately we just need a vacuum of a smidge over 1 psi to equal the weight of the car. As I say – easy. Regenerative electric braking relieves the mechanical brakes somewhat so with reduced cooling requirements the discs and calipers can be mounted inboard on the motor plates which in turn can also double as suspension mounts. The reduced unsprung weight will give superlative handling. These power and suspension units can be deployed over a wide range of vehicles so, as I said, there is nothing particularly expensive here, in fact, quite the reverse. Anyone about to buy a £2m hypercar might like to pause for thought; the new era regular sports cars will soon leave it for dust.